A farewell was made to Ben Windsor at the clubnight on 7th March. Chris Morley, who was WAOC Chairman when we first met Ben about 8 years ago, summarised the excellent work he has done for the club and presented Ben with a mug which featured Ben's maps. A thank you to Ben Windsor, Level2 coach. We are sorry to have to tell you all that Ben Windsor and Zuzka are moving on to London for work reasons on 21st March and will no longer be with the club at our training nights. Ben did may things for many years for our club although absolutely a member of CUOC from coming up to Cambridge as a Maths undergraduate. As he leaves in 2018 to join a London club I am equally absolutely assured that DRONGO will be his number one club. In the early days of clubnights (organised and overseen by Caroline, Ursula, and Chris), Ben was the regular (every week) coach to the juniors and to them was the image of our club. Whilst Peter Allen and Helen Bickle coordinated later on Ben enabled us to expand our clubnight orienteering by mapping many sites in and around Cambridge. 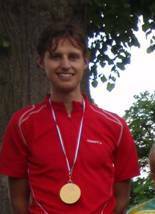 Time passes and now Ben joins another part of the orienteering community and he will no longer be seen with us helping at WAOC events or at the PuntO as a member of the usually winning team (see photo below). However memories remain and we will always have the many moments learning skills at training evenings from maps usually made by Ben himself of Cambridge colleges or University sites. I hope that when members of the Club meet Ben at JK, Lakes 5 days, or Scottish six days or even perhaps at events in Europe we will be able to join with him perhaps at a club dinner. We certainly wish Ben and Zuzka every orienteering success and happiness in the future.